Many of the baby boomer generation and those who came later may have never heard of the Lincoln Highway unless they have had occasion to travel it. However, it was once America's most famous transcontinental highway reaching from New York to California. In 1912 the definition of a "good" road was one that was graded. Most gravel and brick roads were found in the cities, leaving open roadways, in the pre-asphalt and concrete era, much to be desired. America boasted 2.5 million miles of roads, but most roads were dirt and didn't connect. These dirt roads were bumpy and dusty in dry weather and impassable in wet. Travel by train was easier when going from one town to another. Carl Fisher was a man who turned dreams into reality. In 1909 on 328 acres of farmland Fisher, with the financial assistance from three others, created the Indianapolis Motor Speedway. He paved it with brick in 1911 and thus the Indianapolis 500 was born. He turned a swamp into one of the greatest beach resorts in the United States-Miami Beach, Florida. In 1912, Carl Fisher had the vision of a transcontinental highway that he would call the Coast-to-Coast Rock Highway. About 1902, the American Automobile Association suggested such a road but Fisher had a plan of financing and continuous improvements. With the help of Frank Seiberling, president of Goodyear and Henry Joy, president of the Packard Motor Car Company, his dream was realized. The road, completed by 1915, was named the Lincoln Highway after President Abraham Lincoln. Between 1915 and 1925, America went from having one named highway to having a confusing system of named highways. Painted colored bands on telephone poles marked these highways. Sometimes, several named highways shared a route so it was not unusual to see an entire pole striped in various colors. 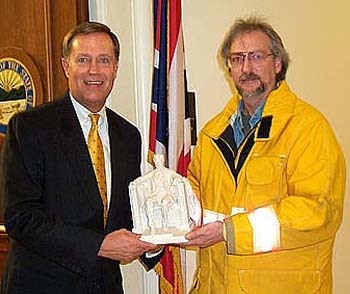 Congressman Mike Oxley (left), 4th Ohio District with Craig Harmon, Founder and Director of The Lincoln Highway National Museum and Archives, Galion, Ohio. In March 1925, the American Association of State Highway Officials (AASHO) started planning a federal highway system. Major east-west routes would be numbered in multiples of ten, from U.S. 10 across the north to U.S. 90 across the south. The major north-south routes would end in 1 or 5, from U.S. 1 between Maine and Florida to U.S. 101 between Washington and California. 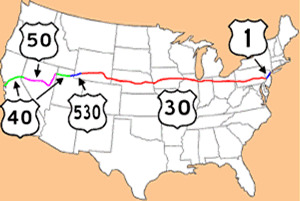 The Lincoln Highway was then broken up into U.S. 1, U.S. 30, U.S. 530, U.S. 40 and U.S. 50. The Lincoln Highway Association was created in 1913 to promote the Lincoln Highway using private and corporate donations. The public responded favorably, and many other named roads across the country followed. Map of the US showing the path of the Lincoln Highway. Americans' enthusiasm for good roads led to the involvement of the federal government in building roads and the creation of numbered U.S. routes in the 1920s. The Federal Highway Administration and the Interstate Highway System are the culmination of these efforts.